Ht / Wt: 6'5" / 249 lb. 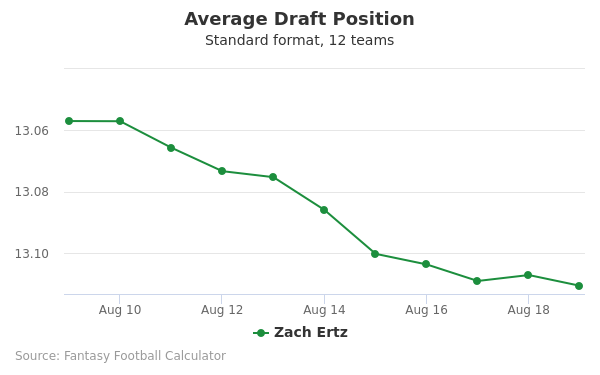 Zach Ertz's fantasy value is measured by his average draft position (ADP) in fantasy football mock drafts. 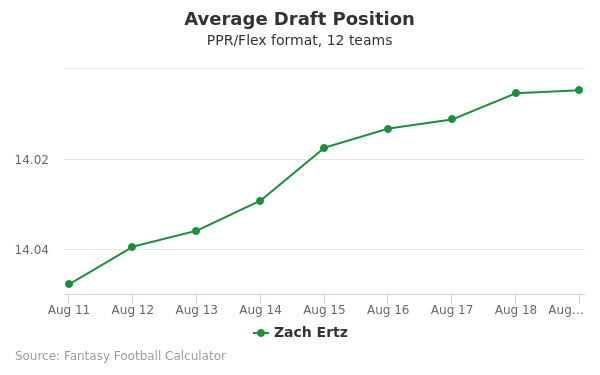 In recent drafts, Ertz's current ADP is 3.01, which indicates that his fantasy outlook is to be the 1st pick of the 3rd round, and 24th selection overall. The code below will display a graph that updates every day to show the ADP data for Zach Ertz for the past 30 days in 12-team PPR leagues. Draft Damien Williams or Zach Ertz? Draft T.Y. Hilton or Zach Ertz? Draft Leonard Fournette or Zach Ertz? Draft Adam Thielen or Zach Ertz? Draft Sony Michel or Zach Ertz? Draft A.J. Green or Zach Ertz? Draft Keenan Allen or Zach Ertz? Draft George Kittle or Zach Ertz? Draft Mark Ingram or Zach Ertz? Draft Aaron Jones or Zach Ertz? Draft Amari Cooper or Zach Ertz? Draft Phillip Lindsay or Zach Ertz? Draft Derrick Henry or Zach Ertz? Draft Stefon Diggs or Zach Ertz? Draft Aaron Rodgers or Zach Ertz? Draft Devonta Freeman or Zach Ertz? Draft Chris Carson or Zach Ertz? Draft Brandin Cooks or Zach Ertz? Draft Derrius Guice or Zach Ertz? Draft Andrew Luck or Zach Ertz? Draft Kenny Golladay or Zach Ertz? Draft Kerryon Johnson or Zach Ertz? Draft Cooper Kupp or Zach Ertz? Draft Eric Ebron or Zach Ertz? Draft Robert Woods or Zach Ertz? Start Damien Williams or Zach Ertz? Start T.Y. Hilton or Zach Ertz? Start Leonard Fournette or Zach Ertz? Start Adam Thielen or Zach Ertz? Start Sony Michel or Zach Ertz? Start A.J. Green or Zach Ertz? Start Keenan Allen or Zach Ertz? Start George Kittle or Zach Ertz? Start Mark Ingram or Zach Ertz? Start Aaron Jones or Zach Ertz? Start Amari Cooper or Zach Ertz? Start Phillip Lindsay or Zach Ertz? Start Derrick Henry or Zach Ertz? 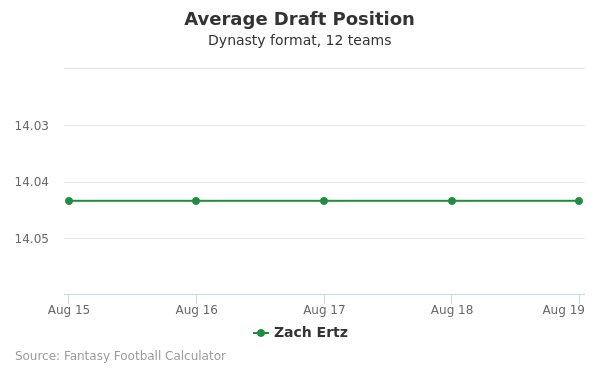 Start Stefon Diggs or Zach Ertz? Start Aaron Rodgers or Zach Ertz? Start Devonta Freeman or Zach Ertz? Start Chris Carson or Zach Ertz? Start Brandin Cooks or Zach Ertz? Start Derrius Guice or Zach Ertz? Start Andrew Luck or Zach Ertz? Start Kenny Golladay or Zach Ertz? Start Kerryon Johnson or Zach Ertz? Start Cooper Kupp or Zach Ertz? 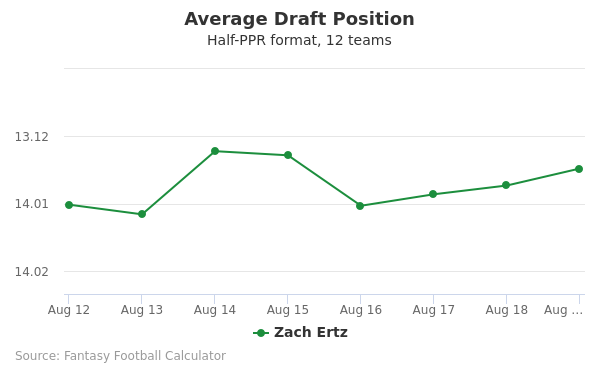 Start Eric Ebron or Zach Ertz? Start Robert Woods or Zach Ertz? Zach Ertz (full name Zachary Adam Ertz) was born on 10th November, 1990. His hometown is Orange County, California where he grew up with his family and attended high school. Ertz is the oldest out of his family with three younger siblings. Growing up Ertz had an early start on learning the ins and outs about football. Between 1981-1984, Ertz father played for the Lehigh University football team with a decent collegiate career. Currently Ertz is engaged to Julie Johnston, an American soccer player and defender for the US women’s national soccer team. ertz and Johnston met at a Stanford home baseball game, which is also where they became engaged as well. The two have been in a relationship since 2012, and engaged since February 2016. Between 2009-2012, Ertz attended Standford University in addition for being a member of their football team. During his freshman year, Ertz decided to redshirt the 2009 season and began actual play in 2010. In 2010, Ertz played 13 games and recorded 16 receptions for 190 yards, and 5 touchdowns. As time progressed, Ertz gameplay became immensely better and it showed in his stats. During the 2011 season, Ertz recorded 27 receptions for 346 yards , and 4 touchdowns. Ertz last year at Stanford (2012), he left on a high note before entering the NFL Draft. After playing 14 games in the regular season, Ertz recorded 69 receptions for 898 yards, and 6 touchdowns. Before being drafted by the Eagles, Ertz made his case pretty clear during the 2013 combine. His 40 time was 4.76 seconds, his vertical jump was 30.5 inches, and his 3 cone drill results were 7.08 seconds. With his football IQ, speed, and ability to adjust quickly to situations put in front of him, his draft pick prospect became pretty decent. The Philadelphia Eagles selected Ertz in the 2nd round (overall pick number 35). With the pick, Ertz signed a rookie contract with undisclosed terms (meaning that his salary information is not available to the public). Ertz is a tight-end for the Eagles and is currently in his 4th season with the team. Out of his entire professional career, he has only missed 3 games. During his rookie year, Ertz recorded 469 yards, 4 touchdowns, and 36 receptions. He also started in 3 games this year. Between 2014-2016, Ertz started in majority of the regular season games. In 2015, Ertz recorded a personal season high of 853 reception yards. His personal season highs from 2016 includes receptions (78), and touchdowns (4). Feel free to take a look at Ertz’s 2015-2016 remarkable highlights. Ertz is not a shy persona by any means on the football field or off the field. If you would like to keep up with him on social media, feel free to follow his official accounts on Twitter, Facebook, Instagram, and his main website. While Ertz typically posts about football related things, you can also see him outside of the Eagles jersey and with his family.